This handy little adapter, enables your MAKO Spearguns 3 in 1 Travel Pole Spear to accept the same Pole Spear Tips used on our Big Game Traveler Pole Spear. 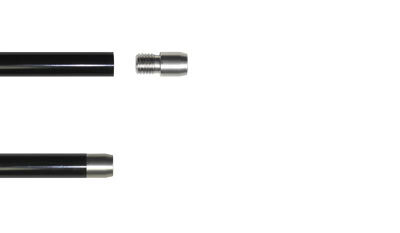 The Tip Adapter opens up a wide array of pole spear tips for the 3 in 1 Traveler Pole Spear. Now you can align your spear tip configuration specifically to the species your hunting. Popular optional tips include the 12 inch Single Flopper, Economical Double Flopper and the Pro Style Double Flopper. Adapts .530 thread to a 5/16”-24 thread. 1. 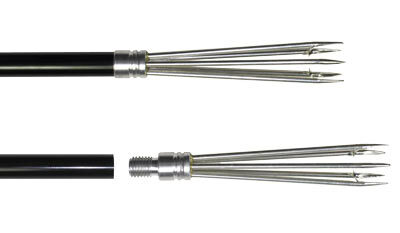 Unscrew the 5 prong tip that comes with the 3 in 1 Traveler Pole Spear. 2. Screw in the adapter and tighten. I enjoyed using this spear and although it wasn’t a quick as I would have liked, I was willing to trade off some performance for the portability that I got. I put the 3 prong with the 3 inch extension on it and the length was about 7.5 feet. Got this along with my 3 in 1 travel spear. Took everything out the other day for the first time and it was all a dream. Mako makes some great products at great prices.